As in most procedures, a complete history and physical examination are the initial steps in the preoperative evaluation of the cosmetic plastic surgery patient. Patients for elective surgery ideally should be medically healthy or cleared for surgery by their internists or other specialists as required. Of great importance, hypertension must be controlled prior to surgery to minimize the possibility of untoward bleeding. Informed consent also is required so that the patient understands the risks of surgery as well as the improvement that can be obtained. Other patients' preoperative and postoperative photographs may be helpful in that regard. However, care must be taken to avoid giving the patient an implied guarantee of results. A skin-only facelift can be performed either as an outpatient procedure or with an overnight stay. Similarly, either intravenous (IV) sedation or general anesthesia can be used. After a sterile preparation and drape, mark the proposed skin incisions. A solution containing lidocaine with epinephrine is infiltrated into the proposed skin incisions and into the area that will be undermined during dissection. One way to avoid using dangerous amounts of either lidocaine or epinephrine is to use 0.5% lidocaine with 1:200,000 epinephrine at the incision sites and then use 0.25% lidocaine with 1:400,000 epinephrine for injection into the cheek and postauricular regions. The dose for lidocaine ranges from 3.5mg/kg of body weight(without epinephrine) to 7mg/kg of body weight with epinephrine. It is important to remember that in an elderly population ,epinephrine is is not without its risks. The total dose of epinephrine injected should be also be carefully monitored and tailored appropriately to the patients condition. Waiting at least 10 minutes for the hemostatic effects of the epinephrine is advised. Dissection in the posterior neck continues anterior and superficial to the platysma muscle. A submental incision often is used to undermine the neck skin and treat platysmal banding if present. Carry out subcutaneous dissection in the cheek only to the extent of where the excess laxity is present. The recent trend has been for a more aggressive undermining of skin; however, use a less aggressive approach in patients who smoke. As one dissects further medially, the chance that insufficient blood flow may lead to skin slough or poor healing is increased. When the skin undermining is complete, meticulous hemostasis must be assured. At this point, having the patient's blood pressure at the normal preoperative level is helpful. Otherwise, a factitiously low intraoperative blood pressure may fool the surgeon into thinking that hemostasis has been obtained. In this situation, a return of the patient's normal blood pressure may lead to hematoma formation in the postoperative period. The direction of vector pull for the undermined skin then must be decided. Typically, the cheek skin is pulled laterally and superiorly in a direction parallel to the nasolabial fold so that the skin originally over the tragus is elevated to the superior helical rim. A purely vertical vector is to be avoided to prevent a "lateral sweep" deformity. In the postauricular region, a more vertical upward vector is used. Tacking sutures at two points holds the flaps in correct position so that the excess skin then can be excised carefully. Removing more skin produces a tighter pull but this is at the expense of increased tension on the closure. Minimize tension at the closure site to help prevent excessive or widened scars. Also, earlobe deformities are more common when tension is applied at the inferior lobe. Drains, if used, may decrease postoperative swelling or seroma formation. Carefully undertake closure of the skin in layers. If a posttragal incision was used, also perform defatting of the new tragal skin and tragal reformation. In males, individually cauterizing hair follicles of the new tragal skin may be required. This helps prevent beard growth that was previously on the cheek from growing in an unnatural location over the tragus. Even with this maneuver, other depilatory techniques may be required later. Apply Xeroform strips or ointment to the incision site and apply a very loose dressing. Do not use a pressure dressing in an attempt to prevent hematoma, since pressure on the skin flaps may have undesirable consequences. 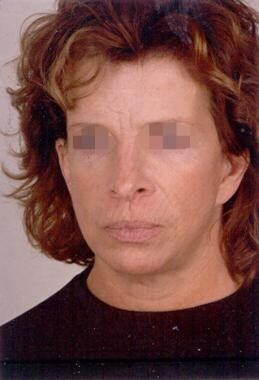 Patients who have undergone facelifts require close observation in the postoperative period. Before leaving the operating room, inspect the dressing to ensure that no undue compression is placed on the skin flaps. An overly tight dressing should not take the place of meticulous hemostasis. The patient's blood pressure also is maintained within that patient's normal range. The patient's head is elevated to minimize edema but no ice is used on the skin flaps. Appropriate pain control can minimize the chance of a hypertensive episode that is related to patient discomfort. Nausea and emesis also must be avoided since this can cause an increase in bleeding or swelling. Preferably, a nurse monitors the patient overnight but the patient also can be monitored at home by a responsible adult. Checking on the patient in the early postoperative period can detect early hematoma or skin ischemia problems. Furthermore, early evacuation of a hematoma may prevent secondary skin flap ischemia or infection. If flap ischemia is detected early, then releasing a few of the skin sutures may limit the skin slough. Allowing a small portion of the wound to heal by secondary intention is usually preferable to a large skin slough. On postoperative day 1, the dressing and drains, if present, usually are removed. Instruct the patient on basic wound care and limiting activity for the next few days. Early follow-up care is optimal for ensuring that no complications are developing. Sutures usually can be removed in 4-6 days in non–hair-bearing regions and in 7-10 days elsewhere. Also give patients reassurance that the swelling and bruising may take several weeks to fully subside. Follow-up protocols vary, depending on the patient and amount of surgery performed. Generally, follow-up visits are scheduled at 1 day, 1 week, 3 weeks, 3 months, and then yearly. However, that schedule is adjusted according to the patient's needs. Patients who experienced complications should be seen more frequently. Although usually a complication-free procedure, as in any surgery, problems can arise. Numerous studies have examined the complication rate after facelift surgery. As expected, the complication rate varies with the surgeon involved and the type of facelift performed. In 1994, Rees et al examined 50 surgeons' experiences with 1236 consecutive facelifts. The hematoma rate varied from 0-3.83%. All occurred within the first 48 hours after surgery. In this study, preoperative hypertension was associated with a higher hematoma rate, as was a below-normal intraoperative blood pressure that later rebounded to normal after the surgery. Those considering a facelift procedure should have stable and controlled blood pressure preoperatively. A long list of prescription and over-the-counter drugs, herbal medicines, and food supplements may adversely affect the coagulation cascade. These substances must be avoided, usually for 10-14 days prior to surgery. Having a patient's blood pressure at near-normal levels prior to the skin closure may limit this problem. Skin slough, or partial flap loss, is another possible complication. It most often occurs in the postauricular region and often is associated with hematoma, infection, or excessive tension on the closure. In 1994, Duffy and Friedland examined 750 patients who had undergone subcutaneous facelift procedures and found a 0.5% incidence of skin slough. However, approximately 1% seems to be average. Flap loss in patients who smoke is likely higher due to the negative effects nicotine has on platelets and the microcirculation. [26, 27, 28, 29, 30] Riefkohl in 1986 also correlated cigarette smoking with a greater incidence of skin slough in patients undergoing rhytidectomy. Patients ideally should refrain from smoking 3 weeks before surgery and 2 weeks after the operation. In those who smoke, the amount of undermining of the skin is usually less aggressive to help minimize the possibility of skin healing problems. Another possible risk factor for skin slough is prior acne scarring. The subdermal scar associated with acne may compromise blood flow to portions of the flap. Good judgment by the surgeon is required in these situations to determine the amount of undermining that can be performed safely. Facial nerve injury is a dreaded but possible complication. Fortunately, it is rare. A subcutaneous facelift that does not violate the SMAS or platysma poses less of a chance for this complication. Robbins found 0 palsies in 226 subcutaneous facelifts,  while Duffy and Friedland found 0.5% in 750 patients. The buccal branch is the most commonly injured facial nerve branch but it may not always be recognized or clinically significant given the considerable overlap it shares from other branches. In contrast, the marginal mandibular and temporal branches may have little or no cross innervation, and injury to these branches is much more noticeable and problematic. Certainly, a meticulous dissection and a thorough knowledge of anatomy can greatly minimize the possibility of a facial nerve injury in a patient who has undergone subcutaneous facelift. Overall, the most commonly injured nerve after a facelift is the great auricular nerve. This can produce sensory disturbances in the ear or posterior auricular region and can be quite a nuisance to patients. Again, knowledge of where the nerve is in danger should be able to minimize this complication. Although very rare, two of the most dreaded complications are deep venous thrombosis and/or pulmonary embolism. Both have occurred after facelifts and they have the potential to be very serious or even fatal. Patients undergoing facelifts are at modest risk of blood clots given their usually older age (>40 y) and the length of the procedure. General anesthesia also can increase the risk. Therefore, appropriate precautions are recommended to minimize risk. These include the use of pneumatic compression devices or low-dose subcutaneous heparin treatment before surgery. Minor problems after facelift occur but fortunately are rare, and each should have an occurrence of less than 1-3%. These include infection, alopecia, hypertrophic scars, earlobe deformities, prolonged edema, and hairline contour irregularities. Careful preoperative planning, attention to detail, and minimal skin closure tension should minimize the possibility of each occurrence. These are considered finesse issues and the surgeon's experience and careful preoperative planning and technique can minimize these problems. The preoperative and postoperative images below show outcomes of skin-only facelift. Facelift, skin only. Preoperative frontal view of a 48-year-old woman. 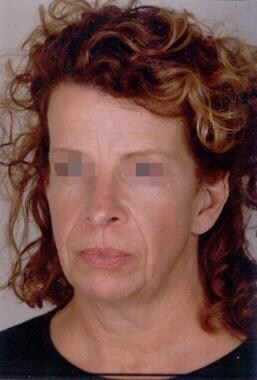 Frontal view 11 months after a subcutaneous skin-only facelift. Facelift, skin only. 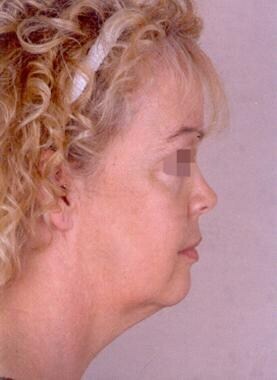 Preoperative side profile of a 47-year-old woman. 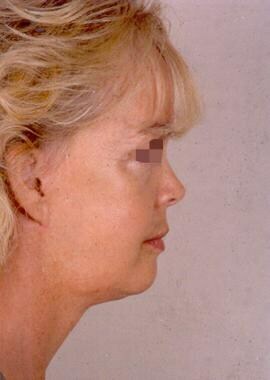 Side profile 9 months after a subcutaneous skin-only facelift. The subcutaneous (skin-only) facelift still may produce good results in selected individuals but most surgeons agree that paying attention to the deeper SMAS layer (ie, through plication, SMAS-ectomy, or a composite facelift) usually produces a better result. Most also believe that a surgery involving SMAS support usually produces a longer-lasting improvement in the patient's appearance. However, no objective data of this assumption have been obtained. In 1995, Gamble et al compared composite facelifts to subcutaneous techniques and found that the composite flap resisted stretch more than the subcutaneous flap. This meant that less skin excision was possible for a given tension in the composite flap. However, they felt that this resistance could be overcome by placement of deep support sutures. A skin-only facelift can be combined with anterior platysmaplasty. This allows resection of the supraplatysmal and subplatysmal fat, digastric modifications, and even submaxillary gland excision directly through a submental incision. This adds both time and potential morbidity to the procedure. The last 25 years have seen many advancements in rhytidectomy techniques over the standard skin-only facelift. Most of these techniques address the sagging muscular layers under the subcutaneous tissue. However, in selected patients, a skin-only facelift still may produce safe and pleasing results to both the patient and surgeon. Attention to detail and careful planning should help ensure optimal results. Chuang J, Barnes C, Wong BJF. Overview of Facial Plastic Surgery and Current Developments. Surg J (N Y). 2016 Mar. 2 (1):e17-e28. [Medline]. [Full Text]. Hollander E. Cosmetic surgery. In: Joseph M, ed. Handbuch der Kosmetik. Leipzig: Verlag von Veit. 1912. Miller CC. The excision of bag-like folds of skin from the region about the eye. Med Brief. 1906. 34:648. Kolle FS. Plastic and Cosmetic Surgery. New York: Appleton; 1911. Lexer E. Zur Geischtsplastik. Arch Klin Chir. 1910. 92:749. Skoog T. Plastic Surgery: New Methods. Philadelphia, Pa: WB Saunders Co; 1974. Manchot C. Die Hautarterien des Menschlichen Korpes. Leipzig: Vogel. 1889. Whetzel TP, Mathes SJ. Arterial anatomy of the face: an analysis of vascular territories and perforating cutaneous vessels. Plast Reconstr Surg. 1992 Apr. 89(4):591-603; discussion 604-5. [Medline]. Hamra ST. Composite Rhytidectomy. Plas Reconstr Surg. 1992. 90:1-13. Mani M. Total Composite Flap Facelift and the Deep-Plane Transition Zone: A Critical Consideration in SMAS-Release Midface Lifting. Aesthet Surg J. 2016 May. 36 (5):533-45. [Medline]. [Full Text]. Martén E, Langevin CJ, Kaswan S, Zins JE. The safety of rhytidectomy in the elderly. Plast Reconstr Surg. 2011 Jun. 127(6):2455-63. [Medline]. Pribitkin ED, Boger G. Herbal therapy: what every facial plastic surgeon must know. Arch Facial Plast Surg. 2001 Apr-Jun. 3(2):127-32. [Medline]. Zins JE, Moreira-Gonzalez A. Cosmetic Procedures for the Aging Face. Clinics in Geriatric Medicine. 2006. 22:1-20. Thorn C, Aston SJ. Aesthetic surgery of the aging face. Grabb and Smith's Plastic Surgery. 1997. 633-49. Friedland JA. The cutaneous rhytidectomy. Bernard RW, ed. Surgical Restoration of the Aging Face. 1996. 127-43. Connell BF, Miller SR, Gonzalez-Miramontes H. Skin and SMAS flaps for facial rejuvenation. Guyuron B, ed. Plastic Surgery: Indications, Operations, and Outcomes. 2000. Vol 5: 2583-2607. Barton, FE. Esthetic surgery of the face. Selected Readings in Plastic Surgery. 1997. 8(19):1-43. Basile FV, Basile AR, Basile VV. Triple-anchoring sub-SMAS face-lift. Aesthetic Plast Surg. 2012 Jun. 36(3):526-33. [Medline]. Riascos A. Rhytidoplasty without periauricular scar. Aesthetic Plast Surg. 2012 Jun. 36(3):540-5. [Medline]. McKinney P, Katrana DJ. Prevention of injury to the great auricular nerve during rhytidectomy. Plast Reconstr Surg. 1980 Nov. 66(5):675-9. [Medline]. Hood K, Ganesh Kumar N, Kaoutzanis C, Higdon KK. Hematomas in Aesthetic Surgery. Aesthet Surg J. 2018 Feb 21. [Medline]. Rees TD, Barone CM, Valauri FA. Hematomas requiring surgical evacuation following face lift surgery. Plast Reconstr Surg. 1994 May. 93(6):1185-90. [Medline]. Kaoutzanis C, Winocour J, Gupta V, et al. Incidence and Risk Factors for Major Hematomas in Aesthetic Surgery: Analysis of 129,007 Patients. Aesthet Surg J. 2017 Oct 16. 37 (10):1175-1185. [Medline]. [Full Text]. Jones BM, Grover R. Avoiding hematoma in cervicofacial rhytidectomy: a personal 8-year quest. Reviewing 910 patients. Plast Reconstr Surg. 2004 Jan. 113(1):381-7; discussion 388-90. [Medline]. Kaufman T, Eichenlaub EH, Levin M, et al. Tobacco smoking: impairment of experimental flap survival. Ann Plast Surg. 1984 Dec. 13(6):468-72. [Medline]. Rees TD, Liverett DM, Guy CL. The effect of cigarette smoking on skin-flap survival in the face lift patient. Plast Reconstr Surg. 1984 Jun. 73(6):911-5. [Medline]. Webster RC, Kazda G, Hamdan US, et al. Cigarette smoking and face lift: conservative versus wide undermining. Plast Reconstr Surg. 1986 Apr. 77(4):596-604. [Medline]. Nolan J, Jenkins RA, Kurihara K, Schultz RC. The acute effects of cigarette smoke exposure on experimental skin flaps. Plast Reconstr Surg. 1985 Apr. 75(4):544-51. [Medline]. Mosely LH, Finseth F. Cigarette smoking: impairment of digital blood flow and wound healing in the hand. Hand. 1977 Jun. 9(2):97-101. [Medline]. Riefkohl R, Wolfe JA, Cox EB, McCarty KS Jr. Association between cutaneous occlusive vascular disease, cigarette smoking, and skin slough after rhytidectomy. Plast Reconstr Surg. 1986 Apr. 77(4):592-5. [Medline]. Robbins LB, Brothers DB, Marshall DM. Anterior SMAS plication for the treatment of prominent nasomandibular folds and restoration of normal cheek contour. Plast Reconstr Surg. 1995 Nov. 96(6):1279-87; discussion 1288. [Medline]. Duffy MJ, Friedland JA. The superficial-plane rhytidectomy revisited. Plast Reconstr Surg. 1994 Jun. 93(7):1392-403; discussion 1404-5. [Medline]. Baker DC. Complications of cervicofacial rhytidectomy. Clin Plast Surg. 1983 Jul. 10(3):543-62. [Medline]. Gamble WB, Manson PN, Smith GE, Hamra ST. Comparison of skin-tissue tensions using the composite and the subcutaneous rhytidectomy techniques. Ann Plast Surg. 1995 Nov. 35(5):447-53; discussion 453-4. [Medline]. Tonnard P, Verpaele A, Monstrey S. Minimal access cranial suspension lift: a modified S-lift. Plast Reconstr Surg. 2002 May. 109(6):2074-86. [Medline]. Disclosure: Serve(d) as a speaker or a member of a speakers bureau for: Allergan<br/>Received income in an amount equal to or greater than $250 from: Allergan<br/>Received consulting fee from Allergan for speaker/national trainer.